Follow in the footsteps of the young James Cook and take in the splendour of the beautiful and often breathtaking North Yorkshire Moors and Cleveland Coast stretching from the historic port of Whitby, along miles of unspoiled coastline including Runswick Bay, Staithes and Saltburn. 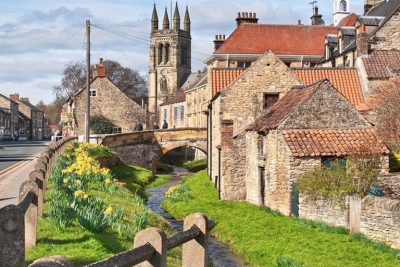 Just short drive through Bilsdale is the popular market town of Helmsley - the starting point of the Cleveland Way & Ebor Way long distance walks. Find a bargain or just browse the market stalls each Friday. The large square is dominated by Sir Giles Gilbert Scott's gothic memorial to the second Baron of Feversham and a stone market cross. Mount Grace Priory is the perfect tourist attraction for a relaxing and peaceful day out. Discover how the monks lived 600 years in the reconstructed monk’s cell and herb plot. If peace and tranquillity is what you seek from a family day out in Yorkshire, then Rievaulx Abbey is the perfect choice. Less than 20 miles from Bilsdale, is the Victorian Spa town of Saltburn-by-the-Sea. Saltburn's proud heritage includes a recently restored pier, Britain's only remaining water-balanced cliff lift and beautiful Valley Gardens amidst fragrant woodlands. The sea shore offers miles of golden sands and rock pools to explore.